I have almost pulled off the Saw Till I have been building. First let me take a moment and share why I so desperately needed one. This has been my solution up until now. The smaller saws separated on the pegs worked OK, but the 5 saws lined up on one pin sucked. I think I should repeat that. . . . it suuuuuccccckkkked. With a capitol "S" Take away the time I put into sharpening those teeth only to have them bang off each other all the time and the threat of them falling off the peg and you still have the fact that every time I needed to use one of the guys, the one I was looking for was never in the front. So I juggle and shuffle like a deck of cards until I get the right one. Every time swearing to build that saw till. Now I had set a initial goal of building this in a day. That just never panned out but I didn't take for granted some of the details that went into putting this together. I think if I were to build another one of these, then a day, a long day, is do-able. This time it's going to work out to about 2 and 1/2 days, but it's what the piece calls for and I don't want to shortchange the work simply because I put up some arbitrary time goal. The other day I built the carcass with dovetailed corners and prepped the dados, I also built and dovetailed a two boards together to make the small saw till. The I got the main carcass glued up. Today I came back and started with a little sanding and then glued the small till into place. I tried locating a dado for the leg several times, in the end it seemed like I was blowing a lot of time for something that wasn't that important. So out came the Kreg Jr. and I drilled some pocket holes. Normally I hate putting something like that somewhere visible, but it is a shop cabinet and I eventually used a pair of the hole plugs that came with the jig when I bought it to fill the holes and make it a little less obvious. I do like the scrolling design and the chasing bead I carved in to the leg. It's a nice detail and details make a piece. I then cut a notch in the top till piece to hold my saw vise. I am so glad to have a home for this too, I hate that it's had to rattle around in cabinets and on the bottom shelf of my workbench. I was always worried that it would fall and the cast would crack and then it would be shot. Here it is protected, I dished and shaped the slot to it's shape and the vice stays in place even if I tip the cabinet forward 45 to 50 degrees. Then I had to plan, measure, and cut the slots for the saws to nestle into. This was less measuring and more of a trial and error process. I placed the first saw in, marked where the blade sat, cut the slot, put that saw into place and measured where the next saw should sit. Once I had three done I could take a measurement and space out the rest of the slots. After making the marks, I would make a kerf cut with my small open handle pull saw. This one would be my favorite saw. After I made the cut I had to think to decide how to effectively widen the kerf so it wasn't binding around the future blade. Eventually I settled on using my rotary tool and an small spiral upcutting bit. The space it produced was near perfect. After trialing the saw a bit I decided to contour the bottom rest. When I was looking at pictures of saw tills online I noticed a lot of them had been built so the teeth of the saws fit into the spaces. On one hand I can understand facing the teeth away from yourself, but having the saw continually lean on the teeth in the till still just didn't sit right with me, the pressure, small as it is, should be on the back. The way the saw handles sat on the front rail just wasn't perfectly happiness to me. So I started a little contouring first with a woodwright's rasp. Then I smoothed up the rasping and further set a chamfer with the belt sander. I'm carefully using the tip of the sander and a very light touch. Makes me think a little of the way you see chain saw carvers wielding their weapon of choice. It takes some practice to get good at free handing something like this though, with a belt sander it's easy to make a big mistake fast. Everything cut and set it was time to go for a test drive. This felt good but not as good as the later test drive. To build the back I needed to resaw some of the 1x pine down to around 3/8" thick. Here's where my shop feels inadequate, because to resaw it's best to use a band saw, and my band saw looks like this. Don't look now it's the mighty mini! Ya well we can all dream big but we still have to start somewhere. The widest this resaws is 3". So I ripped a couple three inch wide boards and cut them the length to fit the back. Then I fed them into the mighty mini and split the down. Ta Da, doubled in width. A little sizing and cutting, some sanding, and ladies and gentlemen we have a paneled back for the till. Now standing it up and looking at it was a cool feeling, but nothing like placing the saws back in to have a real look see. The back is only temporarily tacked in place here, I've number the pieces and I'm going to pull them off and pre finish them before I do a dab of glue and nail them in place. So what's left, some sanding, some finishing, and building the drawer. Can you say hand cut half blind dovetails for the first time. . . next time I hit the shop I will. 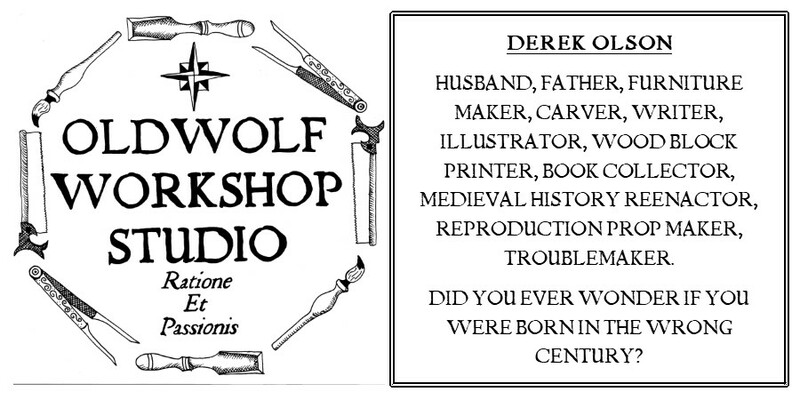 Great project, Derek. I've got an old saw till, thrown together using particle board. It leaves much to be desired from an esthetic perspective and my saws have spilled over into other parts of the shop. Maybe your post will motivate me to do something better. I sure hope so. I'm thinking of building a companion case to hold some of my planes now too. They deserve it as much as my saws do. Looks really slick. Is it just my imagination or does this actually take up a lot less space than the wall hanging? What you going to do with the back? Laps or edge glue? I am thinking a lot about shop organization myself but with garage being in the high 90's I have just been sitting in the A/C and thinking about it. Nicely done. Did you focus on a saw till first because you have more saws than other tools? Will a wall mounted tool chest to match follow? I think my next take is going to be a similar till to hold the hand planes, I have more of those than anything, except maybe chisels. 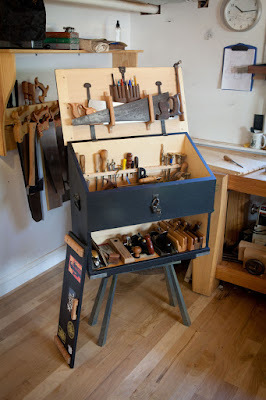 A wall hanging tool cabinet may be in the works after that, I've always wanted one of those too. It doesn't take up less space, a bit more but it's built to allow me to double my collection if I want. I have to laugh because I just moved into this shop and I feel like I'm out growing it already. I'm going to need some serious space soon if I want to keep going :) Dying for an assembly table but there's no room for that, I'll have to think of a sneaky way around that. oh ya I'm gonna puss out and edge glue the back. thought about making ship laps but that would have called it close on the amount of material.